Figure 1. The evolution of terminology related to the provision of distance services using information and communication technology. 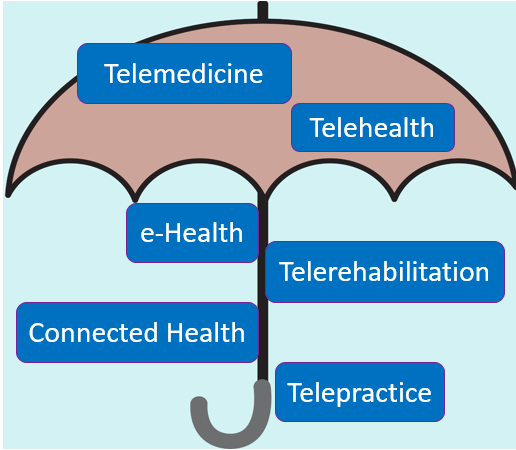 Hearing health care providers have many factors to consider prior to implementing new technologies or adopting new service delivery models specific to telepractice in the field of audiology. 10 key practice considerations are displayed in Figure 2 and summarized below. Figure 2. 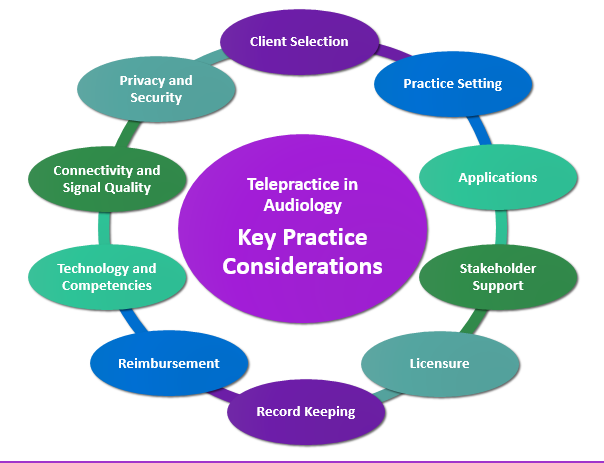 Key practice considerations for audiologists/hearing health care providers looking to implement telepractice technologies/services delivery models in their clinical practice. Client selection: What delivery model/modality is best for your patient/client? Consider access to and comfort with technology(s), patient/client age and related factors (e.g., parental/caregiver support, manual dexterity), and presence of a hearing/vision impairment. Practice setting: Whether your practice setting includes a school, hospital, clinic, university, home or care facility, each setting will present unique technology set-up/maintenance needs and require knowledge and compliance with the regulations and policies specific to the setting. Applications: There are many applications of telepractice. It is important to make sure that the application of interest (e.g., remote hearing aid fitting/CI programming, aural rehabilitation, etc.) aligns with your skill-set, technology requirements, and the needs of the patient/client. Stakeholder support: Do you have the support of all involved stakeholders? Consider planning, advocacy and/or training efforts to reach clinicians, administrators, organizational leaders, sponsors, patients/clients and their family members, for example. Licensure/Certification: What are the regulatory requirements specific to your practice location and to the location in which the patient/client will be receiving services? Prior to starting service delivery, verify licensure/liability insurance requirements according to the governing regulatory body. Record keeping: Ensure compliance with all regulations regarding record keeping, including documentation of informed consent to service delivered via telepractice. Reimbursement: Make sure you have up-to-date knowledge regarding reimbursement for remote services according to applicable payers/sponsors. Knowledge in this area will ensure that you are collecting and documenting the required information and can influence your billing structure. Technology and competencies: Are you confident with your knowledge and technical abilities to provide telepractice in the chosen area of interest? This may present an opportunity to seek out training and/or the availability of an IT support person to assist you. Connectivity and signal quality: Are you able to provide a good quality audio and/or video signal? Requirements specific to the internet connection and bandwidth may vary depending the practice context, the application of interest and/or the communication needs. Privacy and security: Ensure you are compliant with confidentiality, privacy and security of information regulations. Services including electronic transition of information may require you to modify your practices (e.g. data encryption, removal of patient/client identifiers). Current literature suggests that telepractice services are clinically feasible and can be useful in the management of both adult and pediatric populations; however, significant clinical implementation barriers remain.5–7 Considering these encouraging research reports and the generally positive attitudes toward telepractice in audiology, few audiologists (15%) report having direct experience.3 In an effort to better understand the many factors related to clinical implementation/uptake of telepractice in audiology, current research efforts at the National Centre for Audiology are focused on an increasing popular clinical application: Remote hearing aid fitting support. This application often involves synchronous delivery models and various types of technologies (e.g., videoconferencing, smartphone apps, fitting software) to facilitate remote communication/programming between the hearing instrument fitter and the patient/client wearing the hearing aid(s). A two-part study, including practising audiologists in Ontario, Canada (pediatric- and adult-focused) and parents of children who wear hearing aids, has incorporated concept mapping methodologies to generate a conceptual framework related to the underlying clinical implementation factors. Emerging key concepts reveal important barriers and facilitators to clinical implementation that differ according to the population of interest being serviced.8 This research aims to engage and involve the stakeholders at all levels of knowledge development. Findings will help guide the planning and development of tools to assist future implementation efforts related to telepractice within the field of audiology. Glista D, Moodie S, and Scollie S. Factors that Influence Clinician Adoption of Remote Hearing Aid Fitting Support. Conference presentation. Hearing Across the Lifespan. Cernobbio, Lake Como, Italy; 2018. Danielle Glista is a Senior Research Associate at the National Centre for Audiology and Adjunct Professor in the School of Communication Sciences and Disorders at Western University. Dr. Glista's research interests include the development and validation outcome measures for listeners with hearing loss, hearing aid fitting and verification strategies, and advanced hearing aid technologies. Her recent research efforts have focused on factors influencing the clinical implementation of tele-audiology services including remote hearing aid fitting technology.